An extensive range of highly durable, long-lasting soffits, fascias, gutters and cladding are available for homeowners. Each one is guaranteed to increase the aesthetics of your home, whilst also keeping it thermally insulated and protected against the harshest weather conditions. Make sure the exterior of your home looks as good as the interior. Why Invest in Our Rooflines? Keeping your home looking new is easier with our low-maintenance roofline options. Each one of our roofline replacement products enhances the aesthetics of your home, giving it an updated feel. By installing one of the options available, it is guaranteed to reduce your energy bills and protect your home. The options on offer have been manufactured to enhance your property’s aesthetics, adding more value to the building. Each uPVC product provided is made from the highest-quality materials to your exact design specifications to ensure a seamless installation. The range of roofline options we offer are intelligently designed to keep the harsh weather at bay. 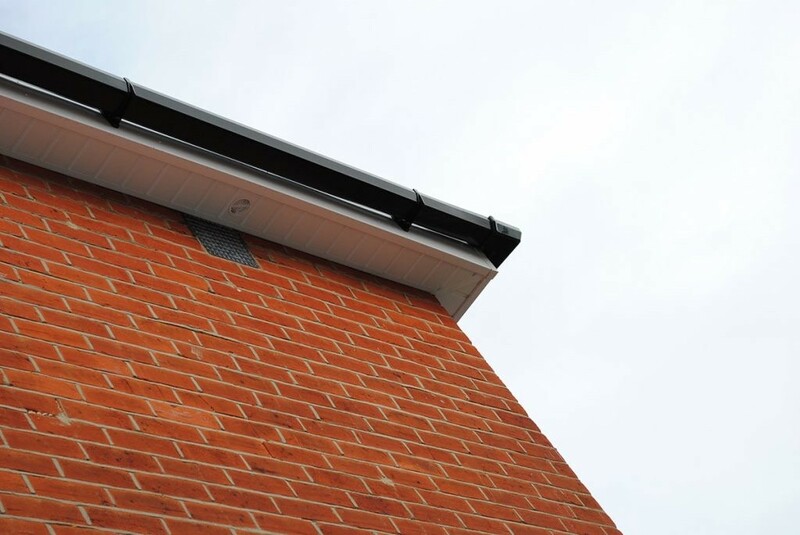 Installing soffits and fascias on to the outside of your property reduces any risk of expensive repairs by eliminating the risk of any water ingress. Each roofline option is designed and manufactured to maximise your time by ensuring they are low-maintenance. Unlike their counterparts, the options available simply require wiping with a damp cloth to ensure it is kept looking new. Increasing the thermal efficiency of your home is made easier with the use of our roofline options too. The cladding, soffits and fascia available all provide an extra layer, increasing the insulation of your home, which helps to reduce your energy bills. To find out more about the roofline options available to you, get in touch. We can guide you through all the options on offer, giving you a breakdown of each product and the cost. This lets you make an informed and educated decision when choosing your replacement roofline in Fleet, Guildford, Farnborough, Woking, and surrounding Hampshire areas. Installing new soffits, fascia, cladding or guttering can be a tough process to deal with. However, our team of highly trained experts are here to put your mind at ease. With their extensive knowledge and years of experience, they provide you with the highest standard of customer service. Here at Hart Windows, we are able to provide you with expert advice on all our products, answering any queries you may have. We will guide you through the process, talking you through the options available to ensure you can make an informed decision. To find out more about our extensive range of roofline options available to you, get in touch today. Our team of highly skilled staff members will be happy to talk through any questions. Either call us on 01252 632 404 to talk to an expert, or use our online quotes generator to get a quote in minutes. How Will Our Rooflines Benefit Your Home? Our variety of roofline options available are perfect for increasing the thermal efficiency of your home, resulting in reduced energy bills. Made from the highest-quality materials, each option is guaranteed to help keep heat inside your home, eliminating cold draughts. The exterior of your home is a focal point for any visitor or passer-by, which is why it is important to keep it looking as great as on the inside. Installing a roofline option will enhance your property’s natural aesthetic, making it look like a newly renovated building. With the extensive range of customisation options available, you don’t have to worry about the exterior of your home not being consistent. You can choose from a range of colour options and finishes to ensure your roofline is exactly as you imagined and match with your existing tiled roof. Our range of roofline options provide an extra layer of insulation for your home, which means your home is kept warm in cold weather. By circulating heat inside your home, it ensures you won’t have to keep turning the thermostat up. Make sure your home is protected against the outside elements by installing new rooflines. The high-quality guttering and soffits available ensure your home doesn’t get damaged by harsh weather conditions. Don’t let your home stand out for the wrong reasons. When choosing from our range of roofline options, you can fully customise them by choosing from a range of colours, making them fit perfectly with your home. Cladding provides an additional external layer to your property. Not only can these boards improve the aesthetics of your home, they also hold many other benefits. Installing our uPVC cladding on to the outside of your home provides it with a clean and sleek look, whilst also providing an extra layer of insulation. Available in a variety of colours and finishes aimed to suit your home, we can guarantee that you will find the perfect cladding. The high-quality material used ensures minimal upkeep is needed to keep it looking its best. Give your home the best form of insulation with our range of cladding options available. The fascia supports the outer roof tiles and guttering of your property and soffits provide protection to the rafter feet whilst sealing the roof space. 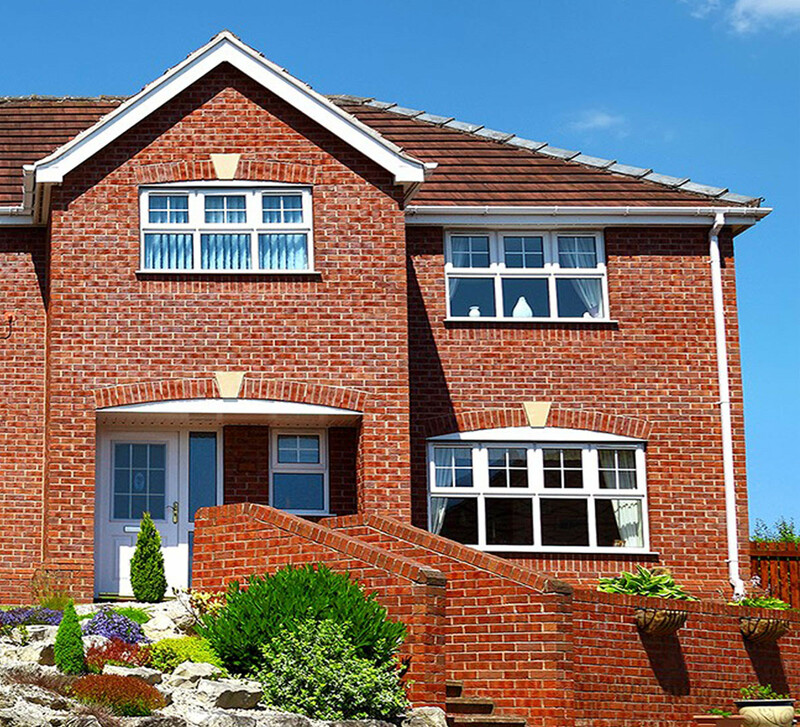 By installing new soffits and fascias, you can quickly and easily transform your home from looking dated to modern. Low-maintenance and aesthetically pleasing, soffits and fascia offer additional protection to the roof of your home from harsh weather, keeping the inside of your home warm and dry. Made from reliable materials, your uPVC soffits and fascia are designed and manufactured to withstand the test of time. Transform your home by installing a new soffit and fascia combination. 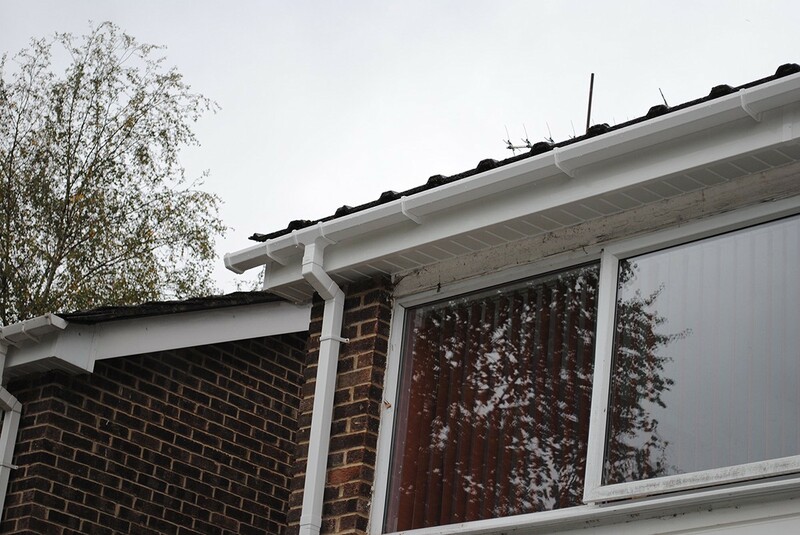 If you are looking to replace your fascias and soffits, you are likely going to need to replace your guttering too. The last thing you want to deal with is water running off your roof into your home. Installing guttering from Hart Windows is the perfect solution. The high-performance guttering is able to withstand any weather condition, making it long-lasting and highly durable. All guttering options available are fully recyclable, ensuring you are doing your bit for the environment. Update the look of your home and keep unwanted water outside with new guttering.